We place a large amount of care into every event, which is why we have such grateful clients. “Where to even begin…Kyle was absolutely wonderful to work with! From the moment we met Kyle, his outgoing personality and easy going nature had us sold on his services. Always responsive to emails and phone calls, no matter what time of day. Very helpful with planning the course of the night and the song choices. He was also patient, professional and very organized. Our wedding day could not have been more perfect! Everything flowed so smoothly, everyone was laughing and having a great time. Little did I know how much the DJ affects the mood of a wedding – Kyle was awesome! – the dance floor was PACKED from the first song to the last! A great time had by all and we have Kyle to thank. (Fulton Productions) really made our reception great!!!! There were so many people on the dance floor and Kyle and his partner really made sure that everyone was having a good time. After the dance everyone complimented on how great Kyle did and how the music he picked out was exactly what we all wanted to dance to. It was the perfect end to our perfect day! We would definitely recommend (Fulton Productions)! Kyle worked with us to design a package that was perfect for our needs. Our wedding dance was a hit, everyone had a great time! Thanks! Kyle was so easy to work with and understood exactly the mood I was going for. He took the time to meet with me and go over everything in detail. I am a music lover and therefore had to turn over the control to someone else, cause the bride couldn't be the dj too :) Kyle is a fabulous DJ!! We got married on that lovely blizzard day 12-11-10, and the dance was a great end to a not so great day. We received so many compliments on the music! Thanks Kyle!! We were DELIGHTED with the services provided by Kyle at (Fulton Productions) for our wedding (both ceremony & reception!). We had some very specific requests and music cues, and Kyle got every single one of them correct. Not to mention I sent several e-mails with changes and requests and he stayed on top of all of them. Our music was perfect, and everyone said our wedding had the perfect soundtrack and it would not have been possible without Kyle! Book him now!!! THANK YOU for everything on Saturday night. The reception was amazing and we couldn't have asked for anything better. Everyone had an amazing time and the music was awesome. I hope you had a great time as well. Thank you for what you do!! We appreciated everything. I wanted to write about my recent experience with (Fulton Productions). Kyle was our DJ for the night and let me tell you what a perfect job he did. He was extremely tentative to our needs, timelines, and brought an incredible energy to the event through the music choices and being cognisant about what feel we really wanted. He was very professional, agreed to meet us before the event, was very flexible and really did the job to perfection. If we EVER need a DJ in the future, this is the one and only service we will be using. I would love to be a referral for anyone that has questions. - Athena, HighFly Clothing & Apparel. You did a great Job! we asked only one thing and that was to keep people dancing and that is what you did. I was impressed at the fullness of the dance floor before the fire spinners and the way you were able to fill it after the fire spinner till the end of the night. Thank you for being apart of our night. I like your presence (how much you talked) not too much, not to little, just right. "We had a great experience with Fulton Productions. Our DJ (DJ Chris) was on time and ready to go as soon as the event started. He did a really good job of keeping the energy of the party exciting and fun, and not to mention the music was a hit with all of the guests! Overall, Kyle and the rest of his staff were wonderful and easy to work with. I would definitely recommend Fulton Productions and I look forward to using their services in the future"
Our Dj was kyle! great guy, very easy going, met all requests from the groom and his guests! Kyle was absolutely wonderful to work with. He was very attentive and energized the crowd. He had a great music selection and was more than happy to accommodate our song requests. I would highly recommend Kyle for any wedding or large group function! Fulton Productions has done great work for us at Hastings High School. As a student council advisor, I can rest assured that the DJ’s will arrive on time, will cater to our requests and have state of the art equipment for an affordable price. I’ve worked with other companies and none have been better received than DJ John Osberg who does a phenomenal job. We’ve reserved him for three of our dances this year!  If you want a quality DJ at a great price that is upbeat and fun to work with, check out Fulton Productions.